Earlier I linked to the Your Message Here project by something's hiding in here. 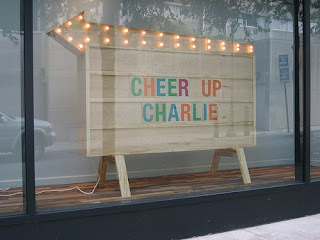 Well, it looks like my sentiment appeared in the window today!! Anybody else out there Willy Wonka fans? Also, heads up...Just Be Jewelry is giving away a necklace over at petit elefant. It's one of my favorites from their shop. Go check it out! How cool that your message was picked! I love your message. Tanner has been talking alot about Charlie here at our house. His teacher is reading the book to them at school. And thanks for the link on your blog. Love ya!! So great. I'm inspired now to make a desk size one for my house. How cool would that be?